Save the pdf file, then type directly into the form. Use the email button in the form to send automatically to AOMC and yourself for your records. 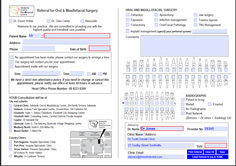 Print the pdf file, and send the completed form back to AOMC via email or post. For all new patients requiring dental treatment, it is preferred that we have a recent OPG xray for the doctor to view at their first consultation. This enables the doctor to consider the placement of nerves, sinus, etc. With the increase of practices now using digital xrays, it is important for all xrays to include patient’s name, DOB and exposure date, and be of good quality when being used to determine your patient’s treatment plan. Please ensure you provide these details when emailing correspondence. If the xrays were taken at Benson Radiology, Dr Jones & Partners, or Radiology SA and are available using InteleRad network – please let us know, so we can download the best quality xray. 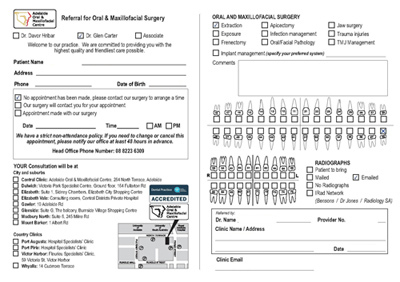 As per the ADA guidelines for dental practices AOMC is now sending secure (encrypted) email correspondence to our referring doctors. Referring doctors – please see our instructions via the link below on how to set up a free Sendinc account to open our correspondence. Once you set up your free account you can receive (unlimited) and send (limited) encrypted emails from the sendinc website.